Say what you will about the highly entertaining Supernatural, but you cannot deny it traffics in the highest stakes on television. 924 min. The CW. Cast: Jared Padalecki, Jensen Ackles. One of the first things actors learn about is the importance of understanding the "stakes" of the scene they're playing. The higher the stakes, the creater the dramatic tension for character and, in turn, audience. Say what you will about the highly entertaining Supernatural, but you cannot deny it traffics in the highest stakes on television. As Season Four of Supernatural opens, one leading character emerges from what amounted to forty years of unspeakable torture in Hell, the stuff of Season Three's cliffhanging ending. And you'd better believe that Season Four—which introduces angels to fight the series' demons—will likewise arrive at, um, a hell of a high-stakes cliffhanger. As guided by series creator Eric Kripke, Supernatural's Season Four is literally apocalyptic, but that doesn't mean the series' writers have forgotten to crack wise and take comedic risks as well as storytelling ones. Brothers Sam and Dean Winchester (Jared Padelecki and Jensen Ackles) carry the heavy burden of keeping the world safe from demons, angry ghosts, ghouls, shapeshifters, Sirens and the like. Dean's sacrificial stint in Hell ends when he is mysteriously plucked out to resume his mission, which turns out to be a mission from God. Getting Dean to believe in divine oversight is step one for the angel Castiel (Misha Collins), a powerful creature who explains that the fight against demons is soon to give way to the ultimate battle of good-and-evil: the planet-cleansing Apocalypse. Dean is purportedly the key to stopping uber-demon Lilith from cracking open 66 seals and setting the Apocalypse in motion. Meanwhile, Sam has thrown in with the seemingly benign demon Ruby (Genevieve Cortese), who Dean tolerates but refuses to trust. In Dean's absence, Sam has grown stronger; by drinking demon blood, he has gained the ability to vanquish demons without any tools of the trade (like a magical demon-killing knife Ruby earlier provided). Of course, such power comes with a price, an addictive physical toll on Sam. As the Apocalypse draws nigh, the brothers puzzle, fret, and enlist the help of some usual and unusual suspects, from family friend/father figure Bobby Singer (Jim Beaver) to the mysterious Anna (Julie McNiven) to blind psychic Pamela (Traci Dinwiddie). Though their lives are necessarily lonely (except for each other and de facto father Bobby), the Winchester boys do dally on the road, and more often with otherworldly beings in "meat suits" rather than plain ol' humans. A life spent mostly in their '67 Impala and crappy motel rooms is no picnic, but it beats the alternative: Hell or the hell of knowing they did nothing to save innocents from the forces of Lucifer. Though Supernatural comes closest to being the heir to Buffy the Vampire Slayer, it owes a strong creative debt to The X-Files' Kim Manners, a producer and frequent director who set the tone for Supernatural. Manners directed two Season Four episodes (including the premiere) before passing away in January 2009. Though the season has a strong "angels and demons" theme reminiscent of Terry Pratchett and Neil Gaiman's as-yet-unfilmed Good Omens, Kripke and his writing staff continue to branch out for often-comically punchy X-Files styled one-offs, such as an episode about a wishing well that features an alcoholic, suicidal seven-foot-tall teddy bear ("Wishful Thinking"). The black-and-white homage "Monster Movie"—wittily set during Oktoberfest in Pennsylvania—digs up Dracula, The Wolf Man and The Mummy, while "Criss Angel Is a Douchebag" makes expert use of guest stars Barry Bostwick, Richard Libertini, and John Rubenstein as washed-up magicians. The series' pronounced sense of humor also extends to a much-hyped episode revealing that Sam and Dean have a stepbrother named Adam (Jake Abel of Flash of Genius); in a wink and a nod to concerned fans, the episode is titled "Jump the Shark." The fans needn't worry: though it does involve a twist, the episode is neither a game-changer nor a cheat. Padelecki (Gilmore Girls) and Ackles (Smallville) continue to turn in rock-solid work in both the serious and silly veins the series taps, and they get able support all around. The Ghostfacers return for a cameo, and other guest stars include Mitch Pileggi (The X-Files), Ted Raimi (Spider-Man), Robert Wisdom (The Wire), Helen Slater (Supergirl), Alexander Gould (Weeds), and Kurt Fuller (Ghostbusters II). With its intriguing use of supernatural lore and weekly blend of horror, action and comedy, Supernatural deserves a better fate than the best-kept secret on television. The upcoming Season Five may be the series' last, if Kripke has its way, but if you haven't started watching, it's not too late. 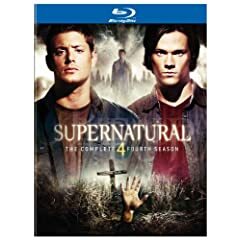 Supernatural: The Complete Fourth Season hits Blu-ray hi-def in a tight transfer that makes the most of the original source material. That material has some limitations, particularly in the series' many low-light situations, and on rare occasions, the image briefly appears filtered through cheesecloth. But for the most part, these discs deliver great clarity and detail, and there's simply no question that, in their full hi-def glory, these transfers lord over their standard-def DVD equivalents. Grain is controlled, texture is fine, and colors run rich and true. Hi-def audiophiles will be disappointed to hear that Supernatural: The Complete Fourth Season comes without lossless audio tracks, but the Dolby Digital 5.1 surround mixes are nothing to sneeze at: they make strong use of directionality, provide sufficient heft to the potent sound effects and, most crucially, present the dialogue with clarity even in the most chaotic of scenes. Though the series' stars don't turn up a lot in the bonus features (with one notable exception), the extras package provided for Supernatural: The Complete Fourth Season is mighty impressive. Disc One includes commentary on "In the Beginning" with executive producer Eric Kripke and writer Jeremy Carver, as well as six "Extended/Unaired Scenes" (7:51, HD), thoughtfully presented in hi-def. Disc Two houses three "Extended/Unaired Scenes" (4:28, HD), and Disc Three three more "Extended/Unaired Scenes" (9:42, HD). Disc Four features two "Extended/Unaired Scenes" (1:16, HD) and commentary on penultimate episode "When the Levee Breaks" with executive producer Robert Singer and supervising producer Sera Gamble and on season finale "Lucifer Rising" with Kripke. The last disc also unleashes a great collection of featurettes and bonus footage. The Mythologies of Supernatural: From Heaven to Hell comprises three interactive menus containing well-produced featurettes on the religious lore that inspires Season Four, explained by experts and tied into the season's and series' themes by its creative team. The Paradiso section includes "The Ageless Unseen War" (9:04, HD), which covers the war between angels and demons with paranormal investigator/author Rosemary Ellen Guiley, psychic researcher/author Richard Senate, Daniel Bouskila of Sephardic Temple Tifereth Israel, USC Dean of Religious Life Varun Soni, Religious Director of the Islamic Center of Southern California Jihad Turk, Kripke, executive story editor Jeremy Carver, USC Associate Dean of Religious Life Rev. Jim Burklo, co-executive producer Ben Edlund, Singer; the self-explanatory "Angels and Miracles" (6:59, HD), which adds The Big Book of Near Death Experiences author P.M. H. Atwater and Gamble to the group of commentators; and "Angels and Archangels" (8:16, HD), which adds co-executive producer Phil Sgriccia. This section also includes "Easter Egg #1" (1:31, SD), a "Ghostfacers" instructional video. The Purgatorio section gathers "The Bonds of Limbo" (8:26, HD), which addresses the spaces between life and afterlife, as traversed by the main characters, ghosts, and Reapers; "Easter Egg #2" (:19, SD) and "Easter Egg #3" (5:03, SD), the latter being "Ghostfacers" excerpts. The Inferno section includes "The Destroyer of Children" (11:08, HD), about the original femme fatale Lilith; "The Sweet Song of Death" (9:20, HD) adding commentator Eidelriz Senga of the Getty Villa Museum for a discussion of Sirens; "The Price of Free Will" (6:25, HD), on the importance of angelic obedience, human choice, and falls from grace; and "Easter Egg #4" (:57, SD), which continues the "Ghostfacers" instructional video. Last but not least, the customary season "Gag Reel" (10:21, HD) is a hoot and a holler that showcases crew and cast, particularly cut-ups Padalecki and Ackles. Fans will love it, just as old and brand-new viewers will love (or fall in love with) Supernatural in this impeccable hi-def set. All site content © 2000-2019 Peter Canavese. Page generated at 04/24/2019 07:26:10AM.